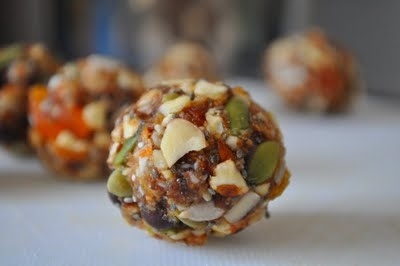 A few months ago, I made these no-bake cookies for a Healthy Snacking presentation. I was speaking to a small group in their office, showing them how easy it is to make nutritious, satisfying, tasty snacks as opposed to simply reaching for a pre-packaged bar or the like. This was one of the healthy snacks I made whilst presenting. I found the recipe (link here) on Oh She Glows, a healthy food blog, and was quite surprised with how darn easy they are to prepare. Angela owns a healthy bakery business, and her recipes are so vibrant, they really are fantastic. So much nutty, seedy, fruity goodness! Be sure to use fresh dates here, not dried. They bind the cookies with their soft, caramel properties. In fact, I rarely use dried dates in my cooking, fresh is best! You can rehydrate dried dates with water, yet I don't get quite the same results and hence prefer to just use fresh. Fresh dates = pure bliss. 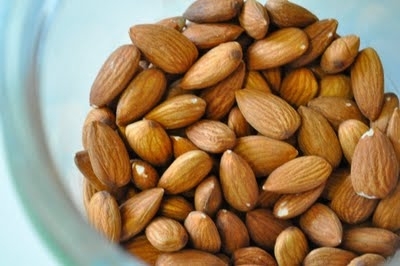 In my batch I doubled the almonds. On purpose. Yep. Well, not quite. It was actually an accident, but I quite like how they turned out. I guess it shows how fail safe this recipe is. Oh, and I used dark chocolate bits in place of raw cacao nibs, because I'm not made of money. These babies are full of protein and fibre, plus lots of vitamins and minerals. I will often whip up a batch when I want a healthy snack for the week but don't have a lot of time on my hands. So I thought I should share the recipe with you! Spread the love, if you will. I really am rather fond of these cookies.